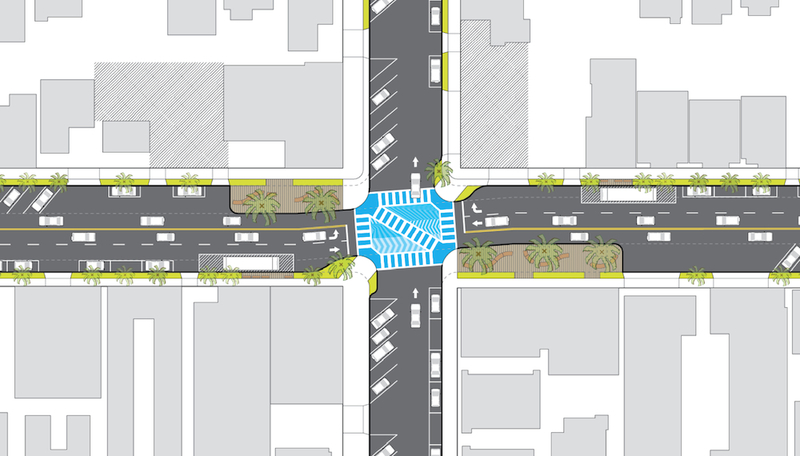 Utile and RSAUD are collaborating on a visioning study for Broadway in Long Beach, California. This stretch of Broadway, which spans from Alamitos to Redondo, crosses at least four distinct neighborhoods. It includes a range of housing, from single-family bungalows to multifamily rental buildings, and business types. In mid-December RSAUD/Utile presented at a public meeting hosted by the office of City Councilwoman Suja Lowenthal. The design team proposed narrowing the street from four lanes to three lanes and adding a slight “chicane” in the road in select places. This has multiple benefits: traffic calming, additional public space on the sidewalks, and shorter–and safer–crossings for pedestrians. In addition, there is the possibility of increasing parking by introducing angled parking. A lively discussion, with both private citizens and City officials contributing, ensued about public safety and improving the life of the street. Now, RSAUD/Utile is further developing the vision for Broadway, taking into consideration the thoughtful comments from the public meeting. The proposed street redesign at Broadway and Falcon. Before and after views of Broadway near Falcon.